When joining a new company, some business leaders will adopt a timeworn formula for ushering in change: Blame previous management, get rid of the old regime and transform the business with a personal vision. But does this work for the leader of a family business? Not necessarily, says John L. Ward, a clinical professor of family enterprise, who explores this type of approach in his new book, Family Business as Paradox. "Our situation is horrible .… Mom and Dad are responsible .… Everyone — aunts, uncles, siblings — who's been in the organization for the last 25 years must go .... I have compelling answers for how to transform the business." "Managing both family and business seems a constant challenge. So much so that the term 'family business' may be considered an oxymoron, a contradiction within itself: for the family is not usually thought of as a business, and business doesn't represent the full reality of the family. Despite whatever contradictions the concept of family business may represent, time and time again family businesses achieve extraordinary outcomes. Twenty percent of family businesses continue past the 50-year point, compared with the 15 percent of the S&P 500 that survives to the 40-year mark. Much research concludes that family businesses not only last longer, but drive greater profits than their non-family counterparts." Ward and his co-authors, Amy Schuman '05 and Stacy Stutz '99, stress that family businesses require novel thinking rather than prescriptions for change. They offer a roadmap for learning to recognize and manage apparent polar opposites in common business dilemmas. In their model, a successful new leader would find solutions that both honor the past and promote change. "The tension of living with paradoxes strengthens adaptability," Ward says. "It creates the capacity to expose the company to new and different thoughts and become more complex in its thinking." Ward is co-director of Kellogg's Center for Family Enterprises, a consultant and author of seven books on family business, including another recently released book, When Family Businesses Are Best: The Parallel Planning Process for Family Harmony and Business Success (Palgrave Macmillan, 2010), co-authored with Randel Carlock. 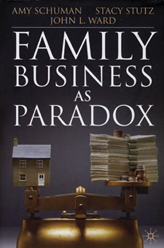 During his 35 years of research, Ward identified a paradox at the root of all family enterprises: Families are cooperative, socialistic systems based on emotion and unconditional acceptance, while businesses are capitalist, competitive systems based on reason and meritocracy. Yet the best family businesses thrive by synthesizing apparent opposites. For example, family members might disagree over whether to make a major acquisition that requires heavy borrowing and would limit a company's ability to pay dividends. "The question becomes perceived as, 'Are we going to go with growth or make sure we've got the dividends for security and income?'" Ward says. "The business perspective would recognize that the family feels like it's risking everything. The (underlying) question is, 'How can we give the family security so they're comfortable taking a major risk?'" A resolution would embrace both growth and liquidity — perhaps by selling an asset or slowing investment in another part of the business to help fund the acquisition, Ward says. In a fascinating appendix, the book offers examples of similar paradoxes within larger corporations. Costco, for instance, combines low mark-ups with high-quality products, and Amazon offers low prices and exceptional service. Both reject traditional trade-offs. "All businesses face many paradoxes," Ward says. "The key is living and coping with them rather than walking away from them."